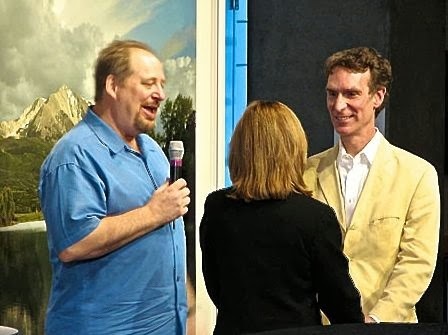 Here's peculiar moment in recent history of science and religion, a meeting of one of America's most prominent evangelical pastors and a pop icon advocate for science education. On the left, Rick Warren. On the right, Bill Nye the Science Guy. Between them stands Blair Tindall, a concert oboist and author with her back to the camera. The occasion is Nye and Tindall's 2006 wedding, which Warren, of all people, performed. The connection between Warren and Nye is Tindall. She is a Southern Baptist, like Warren, and has sought pastoral counseling from him. When she and Nye got engaged in a whirlwind romance that included Nye making the wedding announcement on late night television, the famed megachurch pastor was tapped to do the ceremony. Bill Nye is no longer the Single Guy. Nye, who hosted the educational PBS series 'Bill Nye, the Science Guy' during its nine-year run, married his fiancée Blair Tindall last Friday, it was announced Tuesday. The 50-year-old, bow-tied Nye and Tindall, author of 'Mozart in the Jungle' and a former concert oboist, exchanged vows at a conference where Nye spoke. They were married by the Rev. Rick Warren, pastor and author of 'The Purpose-Driven Life.' Cellist Yo Yo Ma, accompanied by MIT Media Lab Professor Michael Hawley on the piano, performed a wedding march. This is the first marriage for both. The marriage was very short lived. The marriage license was deemed invalid -- it's not clear why -- within weeks of the wedding. It was never made official. Nye and Tindall, who had only known each other for a few months at that point, then had a horrible and strange break-up. The saga entailed poisoned flowers, restraining orders, a surreptitiously returned coffee pot, lawsuits, a $1 million home in escrow, and, for Tindall, some counseling with Warren. The whole ordeal is detailed by The Smoking Gun, complete with court documents. Nye may be a geeky pop culture icon, by his marriage was weird tabloid fodder from beginning to end. More recently, Nye has been using his fame to fight creationists. A few years ago, he passionately argued that creationism is inappropriate for children. It's not supported by the evidence, and, he argues, "completely inconsistent with the world we observe." Not studying evolution leaves people unprepared to deal with the real world. Now he's debating Creation-museum founder Ken Ham on the subject of the origins in February. Tickets to the debate sold out immediately -- all 900 of them. In two minutes. In making these arguments, Nye has sometimes been pressured into taking a stand against religion and the religious, whether they oppose widely accepted scientific theories or not. Nye has resisted, more or less successfully. It's unlikely that Nye's brief association with Warren has anything to do with that hesitation. It also seems unlikely that Nye's decision to devote himself to combatting creationism has anything to do with Warren, though it's true Nye's ex-wife's pastor does reject evolution, even if he doesn't make it a major emphasis of his teaching. The brief association between the two men, captured in this picture, isn't really significant in that narrative in any way that's obvious. It's just a very odd, very peculiar moment in the recent history of American science and religion. Anglican Province in America, Jonesboro, Ga.